The Bhrigu Samhita is an astrological (Jyotish) classic attributed to Maharishi Bhrigu Ji during the vedic period, Treta Yuga, although evidence available suggest it was compiled over a period of time by various shishyas (students in the time age) of Maharishi Bhrigu ji. Perhaps the Bhrigu Shastra set to have penned downed by Shukrachary dictated by Rishi Bhrigu who was master of Brahmvidya. Lord Bhrigu ji was born on fire. His body was charred yet the illumination of knowledge made him shine like fire. Since Shri Bhrigu ji was very learnered. His ego was difficult to appease. In Hindiuism, the trinity of Brahma (Progenitor), Vishnu (saviour) and Mahesh (Destroyer) is well known. The trinity symbolizes God. Once Bhrigu ji in order to judge who among the three gods is the greatest of all. It is said that among the three only Lord Vishnu was able to impress Bhrigu ji. The story goes like this Bhrigu ji in anger had kicked Lord Vishnu on the chest in his false ego to being the greatest Brahmin. On realising his mistake he immediately apologised to Lord Vishnu, who forgave him. It is well known that destiny places role in the formation or birth of remarkable thing. This rude action of Bhrigu ji infuriated Lakshmi ji who cursed Bhrigu ji that all the coming generations of Brahmin will bear the wrath. 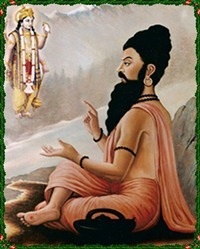 Maharishi Bhrigu ji apologised to Lakshmi ji and suggested him to write Bhrigu Samhita. This Granth would enable to Brahmins to earn their livelihood through the reading done.